As early as 1854, in his treatise The Laws of Thought, George Boole decided « to investigate the fundamental laws of those operations of the mind by which reasoning is performed ». This led him to study the foundations of logic and of probabilities. A century later, Claude Shannon opened the way to a mathematical understanding of information. The fields of research initiated by these two giants have been brought to the forefront of contemporary science; in particular, they have become crucial in the handling of large amounts of data, as well as in the extraction of information out of these data. In large-size problems, collective phenomena of the type studied in statistical phys- ics, like phase transitions, play a major role. 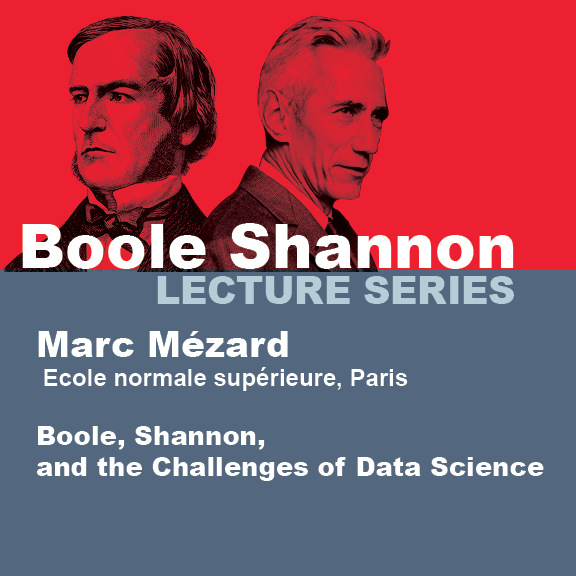 This talk will study the importance of phase transitions in some core problems of Boolean logic and of information theory, with a special focus on the importance of glassy phases. Marc Mézard graduated in 1980 from Ecole normale supérieure in Paris, France. He earned a PhD in physics in 1984. He has been a researcher at CNRS since 1981, and professor at Ecole Polytechnique from 1987 to 2012. He has been the head of the Laboratoire de Physique Théorique et Modèles Statistiques in Université Paris Sud (Orsay, France). He is presently the director of Ecole normale supérieure. He has been visiting scientist in par- ticular at the University of Roma 1, at the Institute for Theoretical Physics, University of California Santa Barbara, at the MSRI (Berkeley University), at the University of Oldenburg. He has received several awards, among which the silver medal of CNRS in 1990, the ‘Ampere’ prize from the french Academy of Science in 1996, the Humboldt – Gay-Lussac prize in 2009. Together with Parisi and Zecchina, he is the recipient of the 2016 Onsager prize from the American Physical Society. He is a member of the European Academy of Sciences.